"Windies" redirects here. For the geographical area, see West Indies. The West Indies cricket team, traditionally known as the Windies (a nickname which became official in June 2017), is a multi-national cricket team representing the Anglophone Caribbean region and administered by Cricket West Indies. The players on this composite team are selected from a chain of fifteen Caribbean territories, which are parts of several different countries and dependencies. As of 24 June 2018[update], the West Indian cricket team is ranked ninth in the world in Tests, ninth in ODIs and seventh in T20Is in the official ICC rankings. From the mid-late 1970s to the early 1990s, the West Indies team was the strongest in the world in both Test and One Day International cricket. A number of cricketers who were considered among the best in the world have hailed from the West Indies: Sir Garfield Sobers, Lance Gibbs, George Headley, Brian Lara, Clive Lloyd, Malcolm Marshall, Sir Andy Roberts, Rohan Kanhai, Sir Frank Worrell, Sir Clyde Walcott, Sir Everton Weekes, Sir Curtly Ambrose, Michael Holding, Courtney Walsh, Joel Garner, Sir Viv Richards and Sir Wes Hall have all been inducted into the ICC Hall of Fame. The West Indies have won the ICC Cricket World Cup twice (1975 and 1979), the ICC World Twenty20 twice (2012 and 2016), the ICC Champions Trophy once (2004), the ICC Under 19 Cricket World Cup once (2016), and have also finished as runners-up in the Cricket World Cup (1983), the Under 19 Cricket World Cup (2004), and the ICC Champions Trophy (2006). The West Indies appeared in three consecutive World Cup finals (1975, 1979 and 1983), and were the first team to win back-to-back World Cups (1975 and 1979). The West Indies has hosted the 2007 Cricket World Cup and the 2010 ICC World Twenty20. ^ Saint Kitts and Nevis are separately represented in the Leeward Islands Cricket Association. Cricket West Indies, the governing body of the team, consists of the six cricket associations of Barbados, Guyana, Jamaica, Trinidad and Tobago, Leeward Islands and Windward Islands. The Leeward Islands Cricket Association consists of associations of one sovereign state (Antigua and Barbuda), the two entities of Saint Kitts and Nevis, three British Overseas Territories (Anguilla, Montserrat and British Virgin Islands) and two other dependencies (US Virgin Islands and Sint Maarten). The Windward Islands Cricket Board of Control consists of associations of four sovereign states (Dominica, Grenada, Saint Lucia and Saint Vincent and the Grenadines). Currently, Cayman Islands and Turks and Caicos Islands, other historical parts of the former West Indies Federation and now British Overseas Territories, have their own teams. National teams also exist for the various islands, which, as they are all separate countries, very much keep their local identities and support their local favourites. These national teams take part in the West Indian first-class competition, the Carib Beer Cup (earlier known as the Busta Cup, Shell Shield and various other names). It is also common for other international teams to play the island teams for warm-up games before they take on the combined West Indies team. The population of these countries and dependencies is officially estimated at around 6 million, which is more than Scotland and the Republic of Ireland. Learie Constantine, who played Test cricket in the 1920s and 1930s, was one of the first great West Indian players. Darren Sammy. The West Indies have won five major tournament titles: the World Cup twice, the Champions Trophy once, and the World Twenty20 twice. Both World T20s were won with Sammy as captain, making him the only West Indian captain besides Clive Lloyd with multiple ICC tournament victories. The history of the West Indies cricket team began in the 1890s, when the first representative sides were selected to play visiting English sides. The WICB joined the sport's international ruling body, the Imperial Cricket Conference, in 1926, and played their first official international match, granted Test status, in 1928, thus becoming the fourth Test nation. In their early days in the 1930s, the side represented the British colonies that would later form the West Indies Federation plus British Guiana. The last series the West Indies played before the outbreak of the Second World War was against England in 1939. There followed a hiatus that lasted until January 1948 when the MCC toured the West Indies. Of the West Indies players in that first match after the war only Gerry Gomez, George Headley, Jeffrey Stollmeyer, and Foffie Williams had previously played Test cricket. In 1948, leg spinner Wilfred Ferguson became the first West Indian bowler to take ten wickets in a Test, finishing with 11/229 in a match against England; later that same year Hines Johnson became the first West Indies fast bowler to achieve the feat, managing 10/96 against the same opponents. The West Indies defeated England for the first time at Lord's on 29 June 1950 and, on 16 August 1950, completed a 3–1 series win when they won at The Oval. Although blessed with some great players in their early days as a Test team, their successes remained sporadic until the 1960s when the side changed from a white-dominated to a black-dominated side under the successive captaincies of Frank Worrell and Gary Sobers. By the late 1970s, the West Indies led by Clive Lloyd had a side recognised as unofficial world champions, a reputation they retained throughout the 1980s. During these glory years, the West Indies were noted for their four-man fast bowling attack, backed up by some of the best batsmen in the world. In 1976, fast bowler Michael Holding took 14/149 in a Test against England, setting a record which still stands for best bowling figures in a Test by a West Indies bowler. The 1980s saw the team set a then-record streak of 11 consecutive Test victories in 1984 and inflict two 5–0 "blackwashes" on England. Throughout the 1990s and 2000s, however, West Indian cricket declined, largely owing to the failure of the West Indian Cricket Board to move the game from an amateur pastime to a professional sport, coupled with the general economic decline in West Indian countries, and the team is struggling to regain its past glory. Victory in the 2004 Champions Trophy and a runner-up showing in the 2006 Champions Trophy left some hopeful, but it was not until the inception of Twenty20 cricket that the West Indies began to regain a place among the cricketing elite and among cricket fans, as they developed ranks of players capable of taking over games with their power hitting, including Chris Gayle, Kieron Pollard, Marlon Samuels, Lendl Simmons, Andre Russell and Carlos Brathwaite. They beat Australia and then host Sri Lanka in the 2012 World Twenty20 to win their first ICC world championship since the 1979 World Cup and then bested England to win the 2016 World Twenty20, making them the first team to win the World Twenty20 twice. As an added bonus, the West Indies also became the first to win both the men's and women's World Twenty20 on the same day, as the women's team beat three-time defending champion Australia for their first ICC world title immediately beforehand. Former flag of the West Indies cricket team used until 1999. This flag became public domain but the current version is copyrighted. Most cricketing nations use their own national flags for cricketing purposes. However, as the West Indies represent a number of independent states and dependencies, there is no natural choice of flag. The WICB has, therefore, developed an insignia showing a palm tree and cricket stumps on a small sunny island (see the top of this article). The insignia, on a maroon background, makes up the West Indian flag. The background sometimes has a white stripe above a green stripe, which is separated by a maroon stripe, passing horizontally through the middle of the background. Prior to 1999, the WICB(C) had used a similar insignia featuring a cabbage palm tree and an island, but there were no stumps and, instead of the sun, there was the constellation Orion. It was designed in 1923 by Sir Algernon Aspinall, then Secretary of the West India Committee. Around the same time in the 1920s the suggested motto for the West Indies team was "Nec curat Orion leones", which comes from a quote by Horace, meaning that Orion, as symbolical of the West Indies XI, does not worry about the lions [of English cricket]. For ICC tournaments, 'Rally Round the West Indies' by David Rudder is used as the team's anthem. Queen's Park Oval – Port of Spain, Trinidad (61/67/6): The Queen's Park Oval has hosted more Test matches than any other ground in the Caribbean and first hosted a Test match in 1930. The ground is considered one of the most picturesque venues in the world of cricket, featuring the view Trinidad's Northern Range. It has a capacity of over 18,000. Kensington Oval – Bridgetown, Barbados (53/37/17):Kensington Oval hosted the region's first Test match in 1930 and is recognised as the 'Mecca' of West Indies cricket. Its capacity was increased from 15,000 to 28,000 for the 2007 World Cup and down to its current capacity of 11,000 post – World Cup. It has hosted two ICC world finals – the 2007 Cricket World Cup Final, which Australia won over Sri Lanka, and the 2010 World Twenty20 Final, which England won against Australia. Bourda – Georgetown, Guyana (30/11/0): Bourda first hosted a Test match in 1930. It was the only Test ground in South America (until the use of Providence), and the only one below sea level and with its own moat (to prevent the pitch from frequent flooding). It has a capacity of around 22,000. It is remembered for the Pitch Invasion during an April 1999, One Day International between Australia and the West Indies, with Australia needing 3 runs to tie and 4 to win off the last ball, a full scale pitch invasion, resulted in the match being deemed a tie, due to the stumps having been stolen before the West Indian team could effect a run out. Sabina Park – Kingston, Jamaica (51/38/3): Sabina Park first hosted a Test match in 1930. The Blue Mountains, which are famed for their coffee, form the backdrop. Sabina Park played host to Garry Sobers' then world-record 365 not out. In 1998, the Test against England was abandoned here on the opening day because the pitch was too dangerous. It has a capacity of 15,000. Antigua Recreation Ground – St John's, Antigua (22/11/0): Antigua Recreation Ground first hosted a Test in 1981. Three Test triple centuries have been scored on this ground: Chris Gayle's 317 in 2005, and Brian Lara's world record scores of 375 in 1994 and 400 not out in 2004. The historic stadium was removed from the roster of grounds hosting international matches in June 2006, to make way for the island's new cricket stadium, being constructed 3 miles outside the capital city expected to be completed in time for its hosting of matches for Cricket World Cup 2007. However, after the abandoned Test match between England and the West Indies in February 2009 at the new North Sound ground, Test cricket returned to the ARG. Arnos Vale – Arnos Vale, Kingstown, St Vincent (3/23/2): The Arnos Vale Ground a.k.a. The Playing Fields first hosted a Test in 1997. National Cricket Stadium – St George's, Grenada (3/23/0): Queen's Park, Grenada first hosted a Test in 2002. Darren Sammy National Cricket Stadium – Gros Islet, St Lucia (6/30/13): Originally the Beauséjour Cricket Ground, first hosted a Test in 2003. It has a capacity of 12,000. This was the first stadium in the Caribbean to host a day-night cricket match. The match was between the West Indies and Zimbabwe. New Zealand was scheduled to play a test in 2014 to mark the return to Test cricket after a break of 8 years. Following the West Indies' victory in the 2016 World Twenty20, the St. Lucian government renamed the venue after captain Sammy, a native St. Lucian, with another St. Lucian – Johnson Charles – having a stand named in his honor after also being part of the 2012 and 2016 championship squads. Warner Park Stadium – Basseterre, St Kitts (3/18/8): The Warner Park Sporting Complex hosted its first One Day International on 23 May 2006 and its first Test match on 22 June 2006. The stadium has a permanent capacity of 8,000, with provisions for temporary stands to enable the hosting figure to past 10,000. Providence Stadium – Georgetown, Guyana (2/21/6): The Providence Stadium hosted its first One Day International on 28 March 2007 for the 2007 Cricket World Cup and its first Test match on 22 March 2008. The stadium has a permanent capacity of 15,000, and is to host Test cricket instead of Bourda. Sir Vivian Richards Stadium – North Sound, Antigua (7/17/4): The Sir Viv Richards Stadium hosted its first One Day International on 27 March 2007 for the 2007 Cricket World Cup and its first Test match on 30 May 2008. The stadium has a permanent capacity of 10,000, and is to host Test cricket instead of the Antigua Recreation Ground. Windsor Park Stadium – Roseau, Dominica (5/4/2): Windsor Park is another home venue for the West Indian team. Construction first started on it in 2005, and it finally opened in October 2007, too late to serve as a venue for the 2007 Cricket World Cup. It hosts first-class cricket and hosted its first test on 6 July 2011 against India, however it held its first One Day International on 26 July 2009. It has a seating capacity of 12,000. 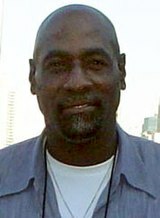 Viv Richards, who has a Test batting average of 50.23 from 121 matches, captained the West Indies from 1985–86 to 1991, a period throughout which the West Indies were the best Test match side in the world. When playing one-day cricket, the Windies wear a maroon-coloured shirt and trousers. The shirt also sports the logo of the West Indian Cricket Board and the name of their sponsors, at present, Digicel, who has been the sponsor since 2005 and of their suppliers BLK. The one-day cap is maroon with the WICB logo on the left of the front, with two yellow stripes. When playing first-class cricket, in addition to their cricket flannels West Indian fielders sometimes wear a maroon sunhat with a wide brim or a maroon baggy cap. The WICB logo is on the front of the hat. Helmets are coloured similarly. During World Series Cricket, coloured uniforms were adopted. The initial West Indies uniform was pink and was later changed to maroon to match their Test match caps. Grey was also added as a secondary colour. In some of their uniforms grey has been dominant over the traditional maroon. Some uniforms had green, yellow or white as accent colour. Former uniform suppliers were Joma (2015-2018), Woodworm (2008-2015), Admiral (2000-2005), Asics (1999 World Cup), UK Sportsgear (1997-1998), ISC (1992-1996) and Adidas (1979-1991). Former sponsors were KFC (2006-2009), Cable and Wireless (2000-2004), Carib Beer (1999-2001) and Kingfisher (1996-1999). The West Indian women's cricket team has a much lower profile than the men's team. They played 11 Test matches between 1975–76 and 1979, winning once, losing three times, and drawing the other games. Since then, they have only played one further Test match, a draw game against Pakistan in 2003–04. They also have an infrequent record in One Day Internationals. A team from Trinidad and Tobago and a team from Jamaica played in the first women's World Cup in 1973, with both sides faring poorly, finishing fifth and sixth respectively out of a field of seven. The Windies united as a team to play their first ODI in 1979, but thereafter did not play until the 1993 World Cup. The side has never been one of the leading sides in the world, however, with their main success being achieving second place in the International Women's Cricket Council Trophy, a competition for the second tier of women's national cricket teams, in 2003. They finished in fifth place in the most recent World Cup, which was held in 2004–05. Their overall record in one-dayers is to have played 45, won 17, lost 27 with one no result. Because of the women's side's relatively low profile, there are few well-known names in the game. The most notable is probably Nadine George, a wicket-keeper/batsman, who became the first, and to date only, West Indian woman to score a Test century, in Karachi, Pakistan in 2003–04. George is a prominent supporter of sport in the West Indies, and in particular, in her native St Lucia, and in 2005 was made an MBE by HRH The Prince of Wales for services to sport. 2016 saw the West Indian women win their first ICC world championship – the 2016 Women's World Twenty20, after beating three-time defending champion Australia by eight wickets at Eden Gardens with members of the men's team in the crowd to support. Known as the 'ICC Knockout' in 1998 and 2000. Brian Lara holds the world record for highest score in Test cricket (400 vs England in 2003–04). An ODI hat-trick performance was made by Jerome Taylor on 19 October 2006 at Mumbai in an ICC Champions Trophy league match against Australia. At the ICC 2011 Cricket World Cup, Kemar Roach became the sixth bowler to claim a World Cup hat-trick against the Netherlands. Courtney Walsh, who captained the West Indies between 1993–94 and 1997–98. This lists all the players who have played for West Indies in the past year and the forms in which they have played. ^ "West Indies cricket team's official name changed to WINDIES". The Indian Express. Mumbai. 2 June 2017. Retrieved 17 August 2017. ^ "ICC rankings – ICC Test, ODI and Twenty20 rankings – ESPN Cricinfo". ESPNcricinfo. ^ "ICC Hall of Fame". ICC. Archived from the original on 9 February 2009. Retrieved 23 September 2009. ^ "Live Cricket Scores & News International Cricket Council". www.icc-cricket.com. Retrieved 6 February 2019. ^ See, for example, 75 Years of West Indies Cricket 1928–2003 by Ray Goble and Keith A. P. Sandiford ISBN 1-870518-78-0, the WICB authorised reference book on cricket in the West Indies. For more information on the first Test played by the Windies, see West Indies Series: Test and ODI Tours. See also the scorecard of the First Test played by the West Indies. ^ "Records / West Indies / Test matches / List of match results (by year)". espncricinfo. Retrieved 26 August 2012. ^ "Scorecard, 1st Test: West Indies v England at Bridgetown, Jan 21–26 1948". espncricinfo. Retrieved 26 August 2012. ^ "Records / West Indies / Test matches / Best bowling figures in a match". espncricinfo. Retrieved 25 August 2012. ^ "Jamaica: A century of sport". espncricinfo. 27 July 1999. Retrieved 25 August 2012. ^ Until June 2001 there was no official ranking of Test nations, with the unofficial epithet of "World champions" being decided by acclaim based on recent results. Although exactly when the West Indies became and ceased to be world champions is therefore disputed – that they were the unofficial world champions for a prolonged period of time is not. ^ "West Indies in England, 1976". ESPN Cricinfo. Retrieved 16 September 2012. ^ "Records / West Indies / Test matches / Best bowling figures in a match". ESPN Cricinfo. Retrieved 16 September 2012. ^ Royal Colonial Institute (1923). "Badge of the West Indian Cricket Team now in England". United Empire. Pitman and Sons Ltd. 14: 350. ^ Aspinall, Sir Algernon (1929). The Handbook of the British West Indies, British Guiana and British Honduras. West India Committee. p. 90. ^ "Bourda First Test". ESPNcricinfo. Retrieved 11 March 2017. ^ "Old Queens park ODI stats". ^ Umar Farooq. "Mushtaq Ahmed signs with West Indies as assistant coach". ESPNcricinfo. Retrieved 20 November 2018. 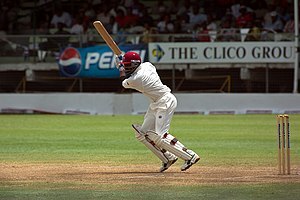 Wikimedia Commons has media related to West Indies cricket team.